The figures in this Presepio, or Nativity scene, date to the late 19th and early 20th centuries. The Presepio is on loan from the Samuel S. Fleisher Art Memorial in South Philadelphia. Each year Glencairn’s World Nativities exhibition borrows crèches from the collections of other organizations. This year the exhibition features Nativities from the Knights of Columbus Museum in New Haven, Connecticut. 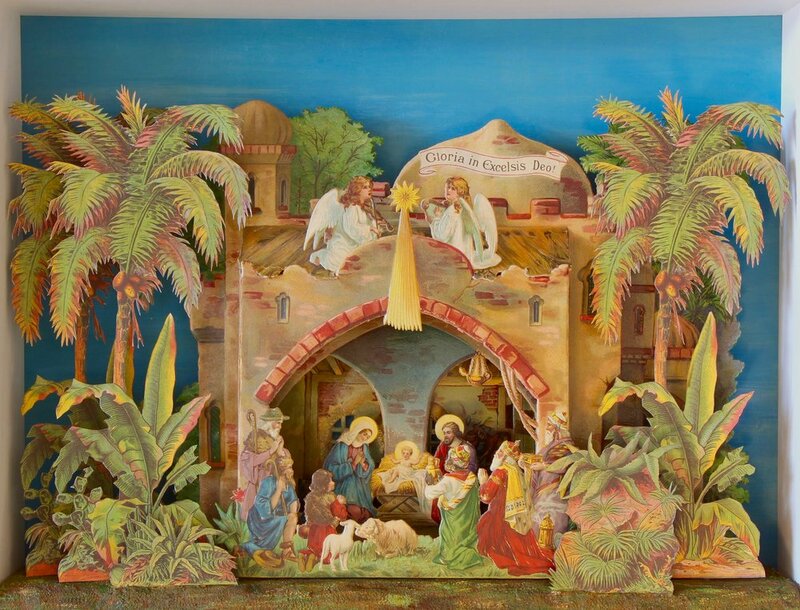 In the 1920s a three-part Nativity scene was made by artist Winfred S. Hyatt. This Nativity was always considered the most important element in the family’s elaborate Christmas decorations. The Nativity can now be enjoyed by the public each Christmas season. The visual focus of most Nativity scenes is the Christ Child, with Mary, Joseph, angels, shepherds, wise men, and animals all playing secondary roles. Do You See What I See? Imagery in Nativity Scenes explores the origins of the various elements that make up a Nativity scene. When Glencairn was a home, large ride-on toy animals, made by the famous Steiff toy company, were parked beneath the Christmas tree for the enjoyment of the Pitcairn family and visitors. The original, recently restored ride-on donkey, is included in our “Christmas in the Castle” tour for the first time this year. 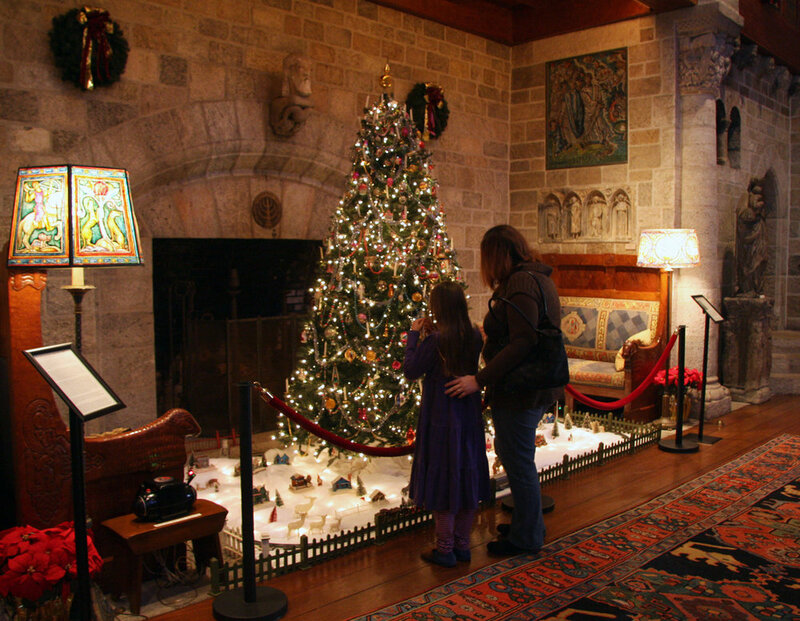 Visitors to last year’s Homeschool Day enjoy Glencairn’s Christmas tree, decorated with vintage and antique ornaments. Make your own paper woven-heart baskets at our ornament workshop this year. These baskets are a 19th-century Danish tradition that has now spread to other countries. Raymond and Mildred Pitcairn in Glencairn’s Upper Hall, posing for their 1954 Christmas card. Glencairn Museum in the snow. "The Glencairn Nativity for the New Century." First displayed at Glencairn Museum in 2015. Photo credit: Rosemary Carroll for Navidad Nativities. A.J. DiAntonio and Michael Stumpf with the completed Glencairn Nativity, in the Navidad Nativities workshop in Bucks County (2015). 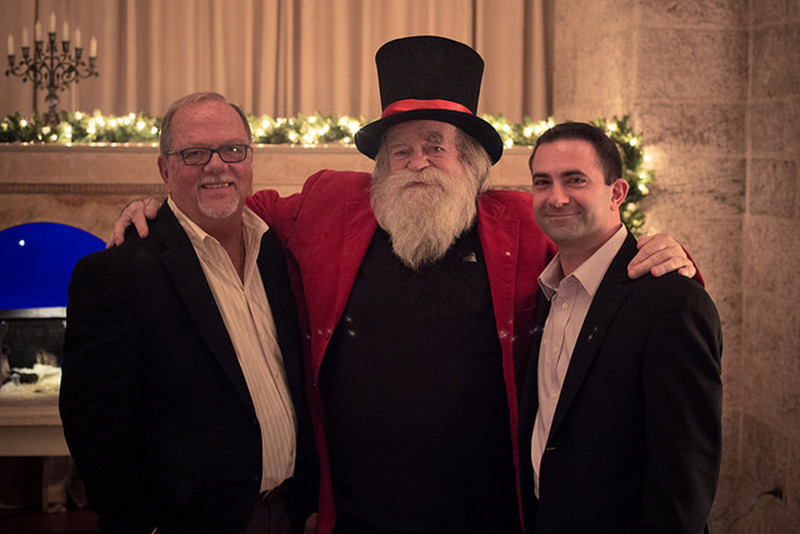 L-R: Michael Stumpf, Jim "Santa Jr." Morrison, A.J. DiAntonio. Credt: Kyle Genzlinger for Glencairn Museum (2015). The Jimenez family of Masaya, Nicaragua, carves Nativity figures from cedar wood, which are then brightly painted by local artists. The father, mother and children are all involved in the process. In addition to the Holy Family, this Nativity includes the wise men and a heavenly host of twenty angels. It will be part of the World Nativities exhibition Friday, November 25, 2016 through Sunday, January 8, 2017. Belsnickel (sometimes translated “St. Nicholas dressed in fur”) was a Christmas gift-giver in early Pennsylvania Dutch communities, making the rounds from farmhouse to farmhouse. Belsnickel brought treats or presents for obedient children, but was ready with a rod or switch to punish naughty ones. This figure will be part of the Christmas in Pennsylvania exhibition Friday, November 25, 2016 through Sunday, January 8, 2017. This Santa, sleigh and reindeer, probably dating to the 1920s, was discovered in a basement storage room in 2016. Old photographs show the decoration being used as the centerpiece for the Pitcairns’ Christmas dinner table. The head of the reindeer comes off to reveal a silver-colored cardboard compartment for holding candy. This well-known class of German candy containers is prized by collectors. Visitors to Glencairn Museum will be able to see the candy container on the "Christmas in the Castle" guided tour, running from Friday, November 25, 2016 through Sunday, January 8, 2017. 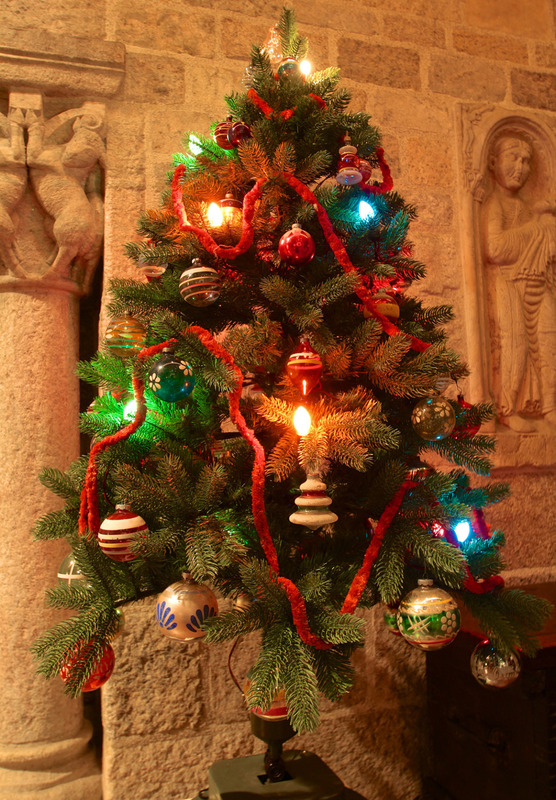 Visitors to the 2015 year's Homeschool Days enjoy Glencairn's Christmas tree, decorated with vintage and antique ornaments. Brother Bob Reinke, a Franciscan friar in Hoboken, New Jersey, spent half a century collecting the ornaments. The village beneath the tree includes an operating 1950s Lionel toy train. This tabletop World War II Christmas tree in Glencairn's Great Hall is featured in the Museum’s Christmas Traditions in Many Lands exhibition (Friday, November 27, 2015 through January 10, 2016). Credit: Glencairn Museum. Pere Noel is the French equivalent of the American Santa Claus. He wears a long, hooded robe edged with white fur, and carries presents in a basket like those used by grape harvesters. 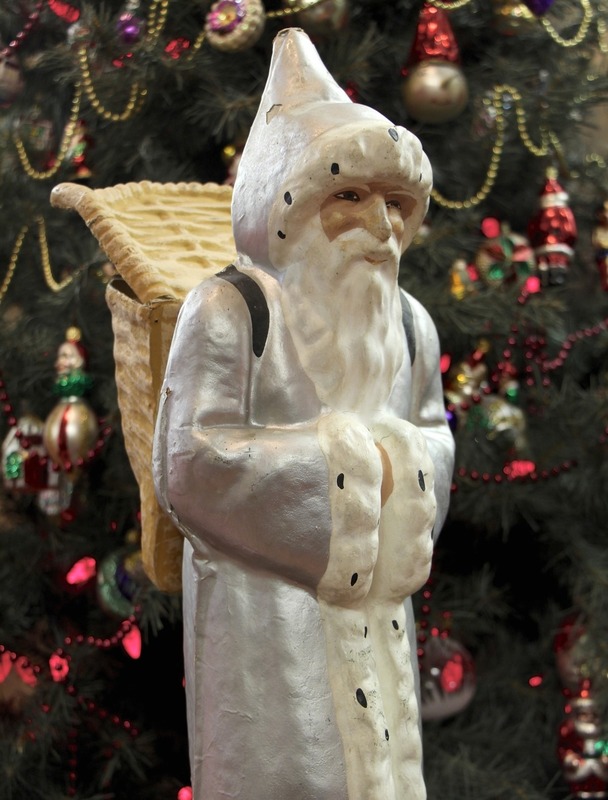 This papier-mache figure of Pere Noel served as a candy container, and was featured in the Museum’s Christmas Traditions in Many Lands exhibition (Friday, November 27, 2015 through January 10, 2016). Credit: Glencairn Museum. 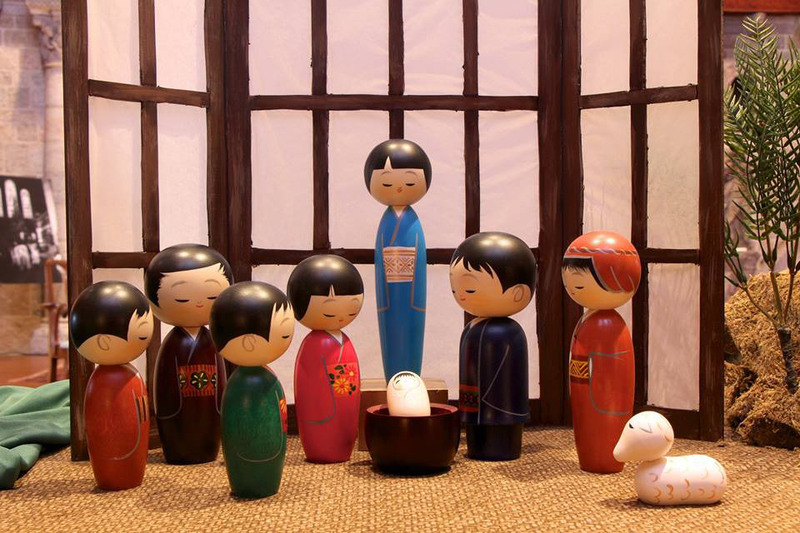 This nine-piece Nativity was designed by Hajime Miyashita for the company Kokeshi Designs. The making of Kokeshi dolls is recognized as a traditional folk art in Japan. These figures have peaceful smiling faces, and their heads are slightly bowed in reverence for the Christ Child. This Nativity was part of the 2015 World Nativities exhibition at Glencairn. Credit: Glencairn Museum. 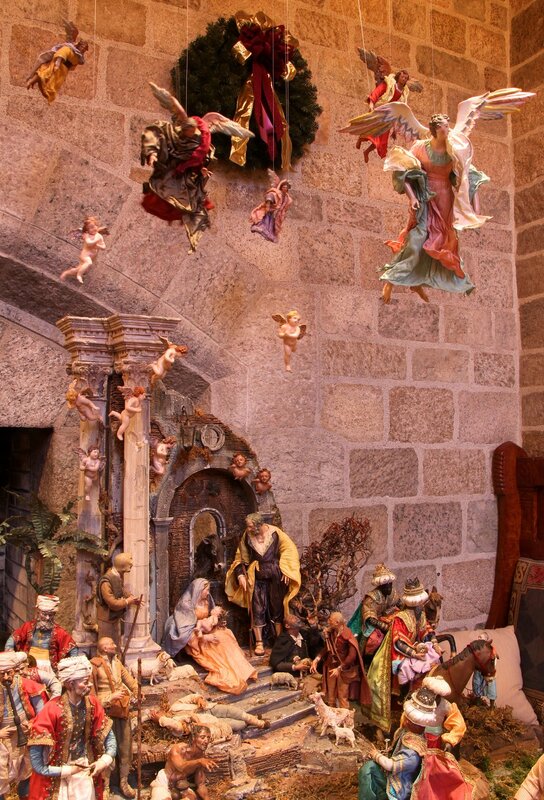 Each year Glencairn’s World Nativities exhibition borrows crèches from the collections of other organizations. In 2013 this Nativity, made in a French monastery by members of the Sisters of Bethlehem, was loaned by Mepkin Abbey in South Carolina. The Christmas Sing features the “Glencairn Horns,” composed of current and former members of the Philadelphia Orchestra. The ensemble plays Christmas melodies and chorals that were collected and arranged in the 1920s by Anton Horner, former principal horn with the Orchestra.